With over 30 years of experience as both a prosecutor and defense lawyer, we have the knowledge and ability to provide you with the professional and personalized representation you'll need. 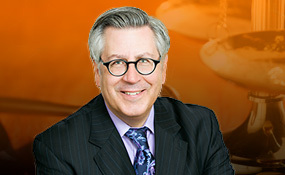 Since 1983 James M. Ventura, has been practicing criminal law in the State of Minnesota. With over 30 years of experience as both a prosecutor and defense lawyer, he possesses the skills and knowledge needed to provide you with the best legal representation available. He has been hired by many of the Twin Cities finest police officers and enjoys referrals from clients, other attorneys, opponents and judges. With our small law office, the attorney you hire will be the person who represents you. We personally handle every case with a professional and zealous attitude. This attitude has allowed us to present a case before the United States Supreme Court and present many lectures to attorneys and police. 1000 Twelve Oaks Center Dr.